BTW where is the center of the universe and how close to it is our planet? It wasn't me that first mentioned the centre. I was curious about what he meant. Large in what sense? What do you mean by an end? This sort of idea usually presumes a topography that we don't know. For example it could be that the universe is not a contiguous volume but rather multiple regions that are sparsely connected. It might not have an end. For one example: if you travel on the surface of our planet there is no end. So knowing the planet's size doesn't help you with the location of the centre on the surface. It may be that there is some cultural centre or some origin point for some species but it doesn't have a centre from it's topography. Also the surface of our planet is a Non-Euclidian space on the scale of the planet. But locally it very closely approximates a Euclidian space for us. It may be the reverse with the universe. Large in what sense? What do you mean by an end? End, as in edge, where there is nothing. Large as in unending. It wasn't long ago that the Hubble Telescope was pointed at a tiny portion of the night sky were every earthbound one only saw darkness. Cosmologists were astounded to find there 10,000 galleries. You still only see darkness there. Wait until we see what the JWST can do.... if they ever launch it. Launch is now set for 2019. What do you mean by nothing and how does that relate to the idea of an edge? Remember everything distant is back in time from anywhere. What is the most distant signal that we are aware of? It's a lot more distant that the objects depicted in the Hubble picture. The theory says there is nothing in the EM spectrum beyond that. It's a wall. Would you settle for a wall instead of an edge? But it might be that there are signals from preceding that radiation encoded in that radiation and gravitational waves are very likely still propagating from before that in time too. The other possible boundary is distance and time related. 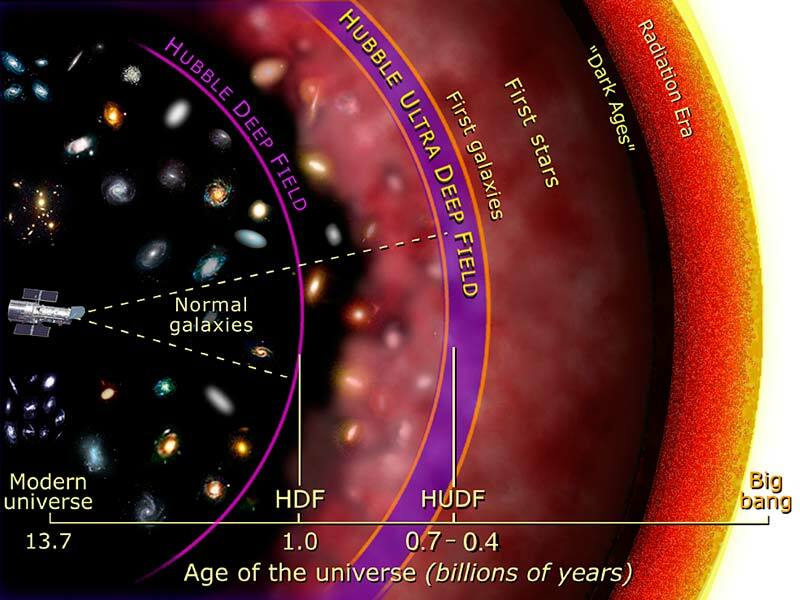 It may be that our observable universe is only a very small part that is visible because the signals, traveling at the speed of light, have had time in the roughly 14 GY lifetime to reach us. Light or signal from other more distant objects may never reach us because of distance and their speed away from us. I want you to imagine that you travel there and eventually you come to a sign that says "Edge of the Universe". In fine print it insists that you take the sign with you if you go beyond and plant it at the furthest distance where you turn around. There is no edge in this because distance is defined etc. It's very likely that there are more stars and galaxies beyond this. Looking at anything very distant is much more like looking at a photo album of your family when you were young. You can't go back there. Their situation is quite different than shown in the photographs. Since 1964 the leading edge (dark red side) of the radiation era has been observable. That's the microwave CBR. It's everywhere in the sky. From COBE, WMAP, Boomerang, Planck, etc they've been recording it. It's not an edge either. It's just the most distant signal. With Hubble and JWST they'll never see an edge just older family portraits of stars and galaxies. If Hubble and JWST were sensitive to the microwave band they'd see the microwave background behind (more distant) the oldest generation of stars & funny looking galaxies. Observations of the microwave background show a dipole (ie different temperatures in the microwave background spatially organized) so we're moving with respect to the background radiation too. By requiring them to renounce atheism, does that essentially require that they convert to Islam? Seeing as Sunni Islam is the state religion of Egypt as far as I'm aware.